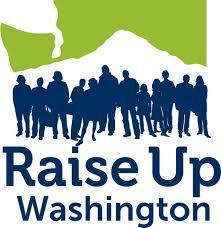 In 1998, EOI worked to pass Initiative 688, making Washington the first state to index minimum wage to inflation. However, with today’s disproportionate job growth in high-wage industries, Washington’s cost of living is outpacing inflation and those annual minimum wage adjustments fall short. Initiative 1433, passed with EOI leadership and engagement of community allies in 2016, set the state minimum wage to increase again over the next several years. These increases provide much-needed relief to low-wage workers across the state, but many are still unable to afford the basics on a minimum wage income. A growing economy means growth of high, moderate, and low-wage jobs, and all of those workers deserve a living wage for their work. In November 2016, almost 60 percent of Washingtonians voted in favor of Initiative 1433, which boosted the economy of our state with a higher minimum wage and paid sick days. EOI was part of Raise Up Washington, the coalition of union, faith, business and community organizations who worked to pass I-1433. Together, we can lift up families and boost our economy so workers and businesses have the opportunity to thrive. Who Benefits from an Increase in the Minimum Wage?